Woo, short for woo-woo, is a term used to describe something that is completely implausible, yet explained with pseudo-scientific and potentially-plausible jargon that can fool innocent sheeple. You can encounter woo in all sorts of places, and most of the time they do no harm. However, when they show up in medicine and finance, they can do quite a bit of harm indeed. And today, we'll discuss the a new wrinkle... physical woo on top of financial woo. HYIP, or "high yield investment program" is a form of ponzi scheme that promised impossibly high yields. Claimed returns like 1% per day is not uncommon. Some of them are pretty transparent in being a scheme, while others may adopt weasel language like "crowdfunding" or "charity". Yet others turn to woo explanations for their ability to pay such high yields that makes absolutely no sense when examined in detail. Frankly, it failed to pass the smell test... If they have techniques that can reliably generate such income, just put down a mortgage or borrow X dollars from credit card or bank, and they'll make it back in no time. Right? Yet there have been, for decades, schemes that attempt to explain their ability to generate such returns, with bogus excuses such as "bridge loans" [DOJ], "P2P lending" [CNBC], "forex" [DOJ], "arbitrage" [wikipedia], "penny auctions" [CBSnews], "prime bank" [SEC] and so on. 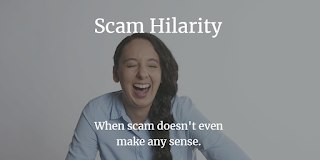 The latest buzzword is cryptocurrency, and it's no wonder ponzi schemes have latched onto it as the latest craze, by incorporating something people who have heard of, but do not understand, as their woo. Some launch their own cryptocurrency (that nobody would ever use), yet others latch onto the idea of cryptomining, the idea that you can "mine" bitcoin and other currencies. 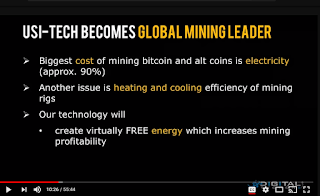 While cryptomining is real, it is hard to make money in such because the hardware to mine and the electricity to run them, not to mention cooling, are expensive as well. It may be possible to run such in China and Eastern Europe, where electricity is cheap (by government mandate) and hardware and labor are cheap, esp. if one exploit scale by running massive crypto-mine. 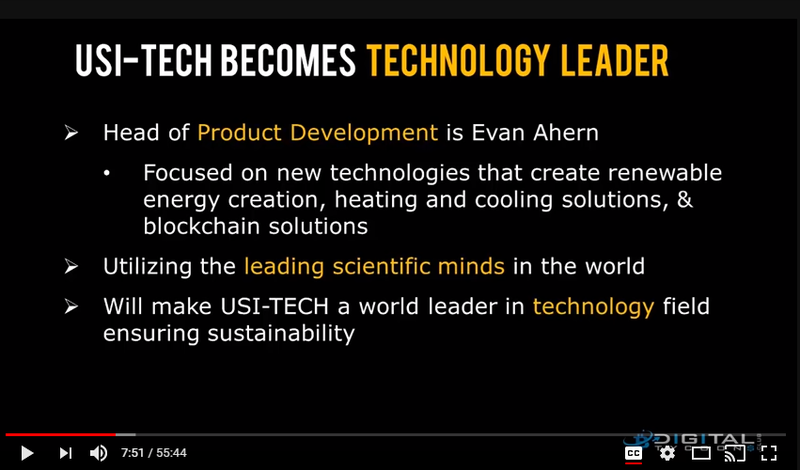 So the latest crypto-woo is launched by a company called USI-Tech, which used to be Forex HYIP (see above), but they've since switched to Cryptomining as their new woo. 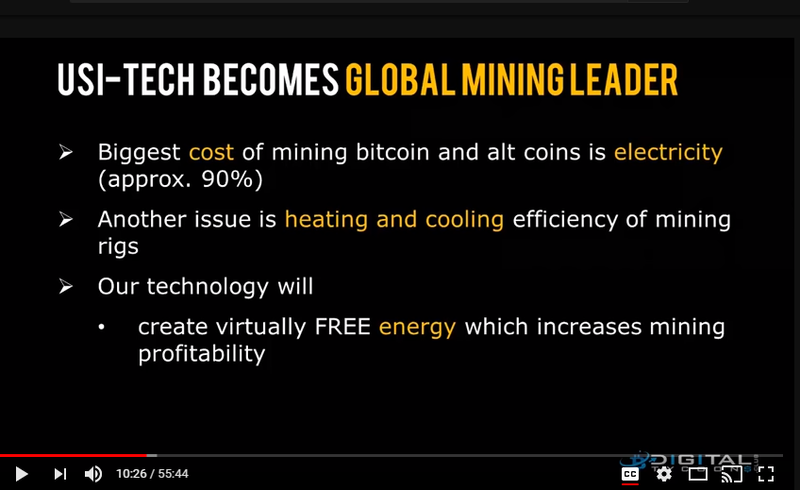 Recently in London, they've shown their latest "innovation"... they can create "virtually FREE energy" to run their cryptomining machines. Perpetual motion machine doesn't exist, as it violates law of thermodynamics. Yet there are plenty of kooks who claim they made one, or claim the knowledge was suppressed by the evil government or energy consortiums or something. Though you had to admit, using one to power cryptomining is rather cute. But what does this thing look like? 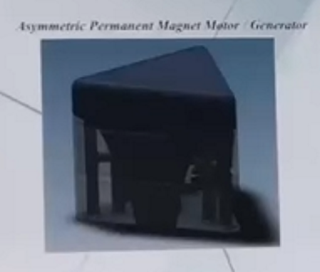 The "Asymmetric Permanent Magnet Motor/Generator"
The "Hydrogen Fuel / Electric Generator"
who was named as "Evan Ahern"
Let's start in reverse order. 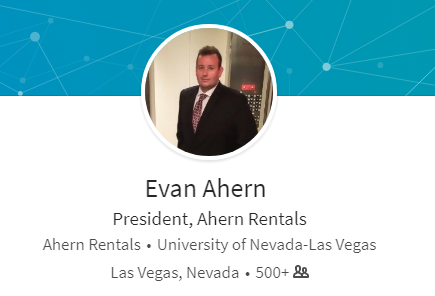 Ahern Rental rents industrial and construction equipment. Looks reasonably close to the blurry picture above, but hey, I don't have a close-up. Call it... 75%? But really, construction guy is suddenly head of product development? Hey, I don't know the guy. So that's a maybe? Next, let's look at that Hydrogen whatever... 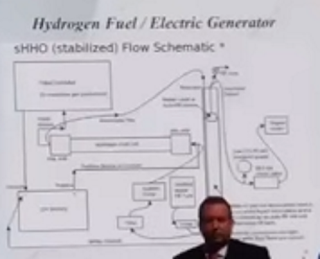 Note what it says: "sHHO (stabilized) flow diagram"
HHO is water, i.e. H2O. What "HHO Generator" is, however, is electrolysis of water into HO and H, into a mixture known as "Brown's Gas or "hydroxy". And while the "principle" is sound, in that HHO gas can be used for fuel, the NET ENERGY is NEGATIVE, i.e. it takes more electricity to make the gas than the gas can be burned for. It's been debunked over and over, even by Mythbusters! Now the woo's been applied to bitcoin mining? Oh, but it gets better! Let's look up "asymmetric permanent magnet generator". Near the top of the search results is probably "Tom Bearden" at cheniere.org and the site was just some ranting about the suppression of discovery. What that website will not tell you is "Thomas E. Bearden" claimed to have invented several perpetual motion machines, which he calls "overunity systems". He'll gladly sell you a "documentary" showing his discoveries. His "masters degree" is from a diploma mill. He calls asymmetric permanent magnet generator "magnetic wankel engine", and claimed it had been suppressed and its inventor silenced via assassination. But let's just try the "smell test" does this story even make sense? Come on, it doesn't. If they managed to create a perpetual motion machine, they can sell it to Tesla or GE or US government or even the Saudis for bajillion dollars. They'll be set for life. But instead, they want to apply perpetual energy machines and "run engine on water" tech to bitcoin miners?! It's hilarious. Really. Where do they come up with this stuff? Haha you make me laugh with your 'scam' call. They don't claim a perpetual motion machine. They claim technology that can minimise the use of power by recycling some of the wasted energy etc. I've been to one of their seminars and have seen them talk about it. 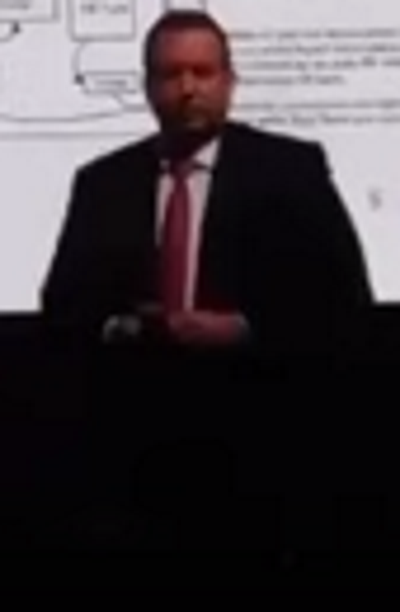 I am also an electrical engineer and know that perpetual energy is still far from reach. But as so many things in world that seem to be fact or proof at the time, new discoveries are made. Nicola Tesla could apparently harness energy out of the air but me nor you will never know whether this was true. He also created something that people thought impossible then. Just like the mobile phone. Something thought so impossible is now an everyday item for the majority of the human race. I'm involved in USI and have only been with them for just over a month. I have already had 60% of my capital paid back out to me and am now pulling in about 1/8 a week in return on capital. So please stop calling scam on things that you only hear about and have nothing to do with. It's pathetic and misleading. It's pathetic and misleading that you, supposedly an engineer, would believe in woo. If that thing works, they could have sold it for billion bucks rather than mining pittance and sharing that with you. You are the one being pathetic and misleading by nitpicking a minor detail when the whole thing made no sense. HOW ARE YOUR WITHDRAWS COMING ALONG? Even Jamie Dimon can not understand Bitcoin or other Cryptocurrency. How much more a keyword blogger trying to understand something he is not using. So you aren't not debating the facts and deductions in the article itself, but instead trying to claim I don't know what I am talking about, with ZERO supporting evidence? LOL indeed. It's just ad hominem attack. Clearly you have ZERO evidence or logic on your side to resort to such unethical debate tactics. Tsk, tsk. You're the only guy who mentioned "random". 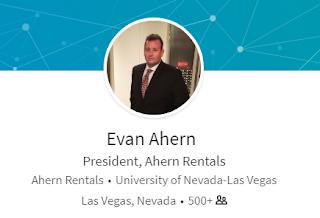 Furthermore, did you bother checking status of "Ahern Investments"? "no longer active" according to CorporationWiki. If you rebut, at least verify your source before you post it, sheesh. This ain't billion dollar company. At best, it's like 200 million, and that's the equipment rental side owned by his dad, Don Ahern. As for "better cheaper source of energy", same observation as above. If it's really that much cheaper, SELL IT to GE or whoever. There is no such "virtually free" source of energy. You're only seeing what you want to see, a mirage. Looks like corporationwiki is out of date, Ahern Investment is caught up on paperwork again as of August 2017. "multi-billionaire" with mailbox companies, yeah right. 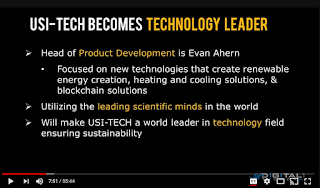 Supposedly Ahern has patents on these two devices. I can find no record of either. Supposedly the generator can provide power for 17 years. This makes no sense. Even if they're mining 20 bitcoin per day at $14k ($280k) plus 100 Etherium per day ($75k) or $355,000.00 per day, this only equates to 1% of $35,500,000.00 the company is paying out on. Being that most people do not pull any money out but rebuy more packages, this can work until too many people start demanding their money. The organization of the payouts is most likely the same as most other MLM's out there. So as far as it being a scam, I think the two patent claims are pure BS but I think the company can run like any MLM. Some work and some don't. Given that you can only mine 144 bitcoins a day, mining 20 would give them 14% of the global hashrate on BTC alone, which they definitely do NOT have. I don't have the info handy on ETH to calculate similar feasibility, but it should be similar.